Like to see the latest Reviews? I think the ideas are great. my sister is an emergency nurse and has seen only couple of these usb key-ring medallions come in with patients but has said what a fantastic device as they were able to get all the info they needed to be able to treat the person faster then trying to do it flying blind. cut down response for treatment that was accurate. im sure that there are many people who would love to include it in fund raising for their schools, charities too. the one thing i think is great, when i did my dads key ring i put a basic medical history and all his current medications and does on it as well. since he is disabled its a load off knowing if he was to have an accident on his mobility scooter that he wouldnt have to try to remember all his details its all on his keyring. i think all emergency departments should promote the use of this device for simplicity and value and the face that in an emergency it can speak for you when you cant. Tony is a life saver of the best kind. keep up the great work we need this product. Your a fantastic man, this is an amazing idea...My partner died in a m/bike crash in april 2016. It took close to 5ish hours to find me. If we had this ICEmergency at the very least i could have been contacted when the accident occurred. I ordered 2 of these last week. They arrived within days and I have now uploaded the information onto them. It is a quick and easy process as the template is already there. I have done 1 for my new P plater son with all his details and emergency contacts (a little bit of peace of mind for me) and also one for me. They are now attached to our respective car keys, hopefully we will never have to use them, but what a great idea. and worth every cent. I am very happy. Thankyou. Super excited that our ICEmergency usbs arrived today. Thanks so much Tony, what a fantastic idea! My iPhone has an emergency app, but I can't go far without my keys. So, now we are covered twice. My hubby and I Love our ICE USBs! Fantastic idea!!!! ie quick delivery and easy to order! Thank you!! Very fast delivery! Excellent ! Cannot thank you enough for the security I feel now for my family! A great idea, purchased one for my husband. He does not wish to have a smart phone, so when i saw this i got onto it straight away, gives me a good feeling knowing he has it…..cheers for your good/hard work. Thank you so much Tony! 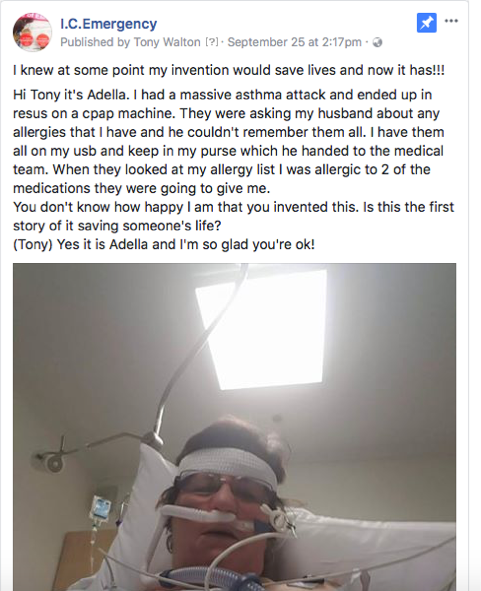 Everyone in Australia needs to have your product! Ordered 2, one for wife and I. We are both from emergency responce backgrounds and understand the importance contacting loved ones. Have u seen these Sparkles Hayley Jones? A very good idea and cheap too and an Aussie company. Like a medic alert, but more information can be stored ??? Just love this product!? A great stocking filler for teenagers gaining their license. I think these should be handed to new drivers when they pass their test. I have purchased half a dozen and found them easy to download my details on and ready to go! Thanks Tony ? I ordered 3 for christmas and recieved them last week. My mum, dad and step-mum need these. So very happy. Thank you ? I ordered and received mine in fantastic time! Highly recommended! Thank you so much! I received my two yesterday. 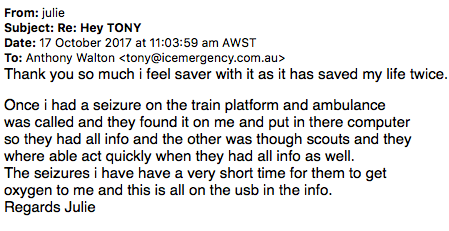 :-) Thank you for sending out so fast:-) I have already put out info on the usb, now we feel if anything happens we are in safe hands. We have these, plus ICE on our phones. Nothing to help anyone other than for emergency aid or contact. Good point re pin code on phones, not allowing ICE numbers to be called. One phone I had allowed it but must check my new smartphone now. Terrific item. So glad I have mine. I've had an ICE contact in my phone for years, but as I have a password on my phone no one would have been able to get it anyway. This way I decide what information goes on there and I know my medical details are available if in an accident etc. Thank you. I also have all this in my phone, but later realised that because I have a pin code no one would be able to access it. Everyone I know locks their phone in case it's stolen, so I think this is brilliant. I received my order today, that's some super fast transacting .... thank you for the peace of mind!! !